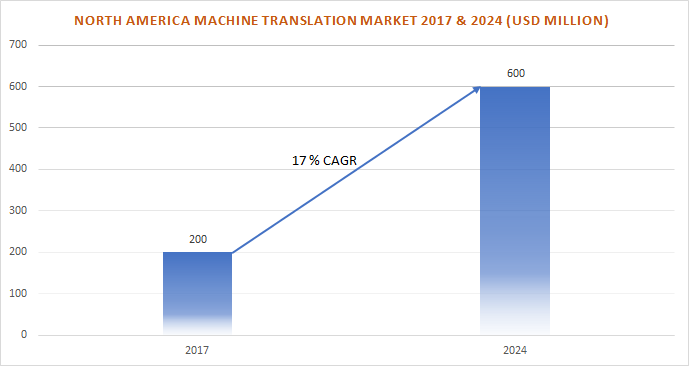 The machine translation market in North America is projected to witness a lucrative growth owing to the demands from the flourishing IT sector of the U.S. IT companies are deploying machine translation into their products to make their solutions accessible to a larger customer base. Companies, such as Google, are investing heavily in machine translation systems to expand its offerings to non-english speaking customers. The company is implementing various strategies to gain a competitive edge over other players. For instance, recently in July 2018, Google announced to launch offline machine translation offering that will support over 50 languages in the translation applications. In April 2017, Google introduced Google Translate for nine Indian languages to gain a larger consumer base, who can access Google applications and data in regional languages. Technological advancements in machine learning algorithms and artificial intelligence are the major contributors for the growth of North America machine translation market. It has enabled rapid translation of regional languages in a cost-effective way and the development of multilingual content for websites has been possible due to advanced machine learning algorithms. Service providers are benefiting from the growing data from social media websites. Natural language processing systems are gaining popularity to gain valuable insights from the customer data, driving the demand for machine translation systems. The data collected from websites and social networking sites are increasing at a rapid rate and requires sophisticated applications to translate the data for effective decision making. The North America machine translation market will witness a significant growth in the healthcare domain. Machine translation is a tool occasionally used in the healthcare for translating instructional content, websites, doctor manuals, leaflets, patient brochures, and other crucial communication materials. Additionally, it is also effective to communicate with Limited English Proficient (LEP) patients. However, the adoption rate of such systems in the healthcare sector was slow due to higher risks of misinterpretation from them. However, with the development of more sophisticated algorithms, the chances of inaccuracies are greatly reduced, and the scope of these systems will rise in the industry, augmenting the North America machine translation market. The prominent players of the North America machine translation market are iFlytek, Sampark, Moravia IT, Microsoft Corporation, Google, Inc., and IBM Corporation.